• No. 5-seed Nicholas Montoya of Scottsdale (pictured on home page) weaved his way through the draw, including knocking off one-seed Dominic Bermudez of Tucson, to pick up second place. Montoya fell to Carlos Bermudez of Tucson, 6-0, 6-3, in the finals. Alex Lawson of Tempe placed fourth. Jacob Spizman of Chandler, with partner Alexander Lineberry of Sedona, chalked up a second place finish in doubles. • The Boys 16 field also saw fierce competition. No. 4-seed Dominic Patrick of Gilbert and No. 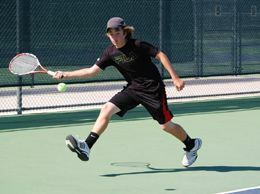 2-seed Jacob Hedderig of Cave Creek both fought off three-set semifinals to earn a spot in the finals Monday morning. But it was Patrick who still had some left in the tank and held on for the title, 6-3, 6-0. Cameron Tehrani of Paradise Valley placed fourth. Tehrani, along with Andrew Mayer of Scottsdale, also picked up the doubles crown, 8-3, dropping James Carr of Tempe and Wade Heerboth of Tucson. • The large Boys 14 field required a Gold and Silver flight, with Gold counting toward national ranking. No. 4-seed Max Wightman of Scottsdale, en route to a finals showdown, defeated one-seed Joshua Hedderig of Cave Creek, 6-4, 6-1. And Wightman fought hard but could stave not off Jared Aldor of Vail, Ariz., in the final, 7-5, 6-3. Hedderig took third, defeating Kyle Chalmers of Tempe, 6-3, 6-0. Aldor and Hedderig snatched the doubles title from Chalmers and Wightman, 9-7. • No. 1-seed Carlos Hassey of Surprise fell ill before the Boys 12 finals and placed second. Marion Pascal of Peoria finished third due to a no-show. • No. 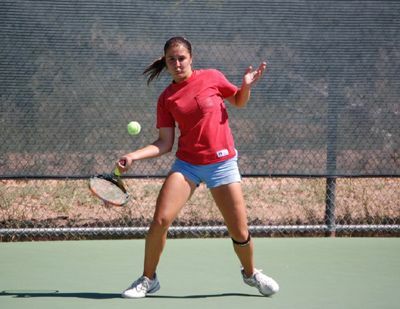 3-seed Stephanie Vlad of Scottsdale continued her dominance over Southwest players, again meeting No. 1-seed Kelsey Lawson of Tempe in the Girls 18 finals. The two went to three sets in their last meeting two weeks ago in Tucson. The first set went to a tie-breaker, but Vlad prevailed, 7-6, 6-2. Four-seed Cassie Hochwalt of Scottsdale battled No. 5 Emily Harris of Scottsdale for third place, winning 6-2, 6-4. Lawson and Mele Iongi of Mesa took the doubles title. • Two-seed Erica Medlin of Mesa showed mettle and battled through a pulled abdomen muscle and two three-setters on her way to a Girls 16 finals showdown with Hailey Rochin of Tucson. And it took Rochin three sets to finally slow down Medlin, 4-6, 6-3, 6-3. • It took three sets, including a tie-breaker in the third, before one-seed Maggie Cohen of Phoenix topped two-seed Alexandra Letzt of Scottsdale in the Girls 14 final, 4-6, 6-4, 7-6. No. 3 Emily Serrano of Phoenix grabbed third over Chloe Lee of Albuquerque, 6-1, 6-2. Serrano and Letzt combined to win the doubles title in a close one, 9-7, over Cohen and Marissa Baca of Oro Valley, Ariz.
• No. 1-seed Delaney Nothaft of Tempe endured a three-hour semifinal match against Melissa Kahn of Phoenix to earn a spot in the finals of Girls 12. But her tank was empty in the end, losing to Maddie Pothoff of Tucson, 6-0, 6-0. Julia Ortiz of Chandler notched a third place finish. Ortiz, partnered with Paris Corley of Grants, N.M., defeated Nothaft and Kahn in the doubles final, 8-2. • One-seed Whitney Goett of Paradise Valley continued her dominance over Girls 10, picking up another title, this time defeating Zoey Nelson of Waddell, 6-1, 6-0. 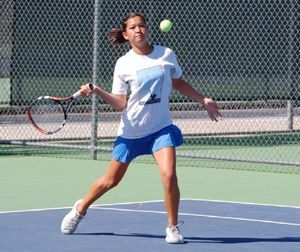 Newcomer Shailla Alda of Phoenix placed third, defeating Cidny Anders of Gilbert, 6-2, 6-0.